Why is it important? It's more critical than you think. A fuse is just a fuse. Right? We know a fuse is made to open when a certain level of current is exceeded. This protects us from electric shock and fires started by overheated wiring. However, some fuses protect us from an even more serious danger. This article explains the hidden dangers of making voltage and current measurements with a tester that does not have the fuse protection that was designed into the tester - dangers that can cause serious burns, and possibly even death. Why does a tester need fuses? There are a variety of testers on the market, from simple voltage detectors to highly sophisticated digital multimeters (DMMs). Testers that make voltage measurements have a high input impedance that makes an overcurrent condition unlikely. As a result, voltage measuring inputs are generally not designed with fuse protection but with overvoltage protection. But if that same tester is designed to also measure current, fusing is required. Current measuring inputs usually employ a simple shunt through which the measured current flows. This shunt's resistance is on the order of 0.01 ohms. Add to that the resistance of the test leads (approx. 0.04 ohms), and you have a short of less than 0.1 ohms. This resistance is adequate when you place this short in series with another load to measure the circuit's current. But it's an altogether different story when you place this circuit across a voltage source, say the plug outlet in your living room. This is an all too common mistake made by people measuring both voltage and current. After making a current measurement with the test leads in the current input jacks, the user tries to make a voltage measurement forgetting the leads are in the amps jacks. This effectively places a short across the voltage source. Years ago, when analog meters were the only instrument for making these measurements, this mistake pretty well destroyed the meter movement (the needle wrapped around the top peg), not to mention the internal circuitry. To protect against this common occurrence, meter manufacturers started putting a fuse in series with the meter's test lead jacks, for an inexpensive and effective solution for a very simple mistake. Today, most manufacturers still design their testers with fuse protection in the current measuring circuits. As technology has moved forward, the science of fuse design has progressed as well. Although understood by people who build testers, the full impact of fusing is little understood by most tester users. When you make that simple mistake of putting voltage across the current jacks and blow the fuse, you're at first thankful you didn't wipe out the meter. But you may then become annoyed with the fact that you have to hunt up a new fuse and replace it before making your next current measurement. Even more frustrating is when you share meters with other people in your shop and someone else blows a fuse and puts the meter away to have the problem discovered by an unsuspecting user. When does a tester become a grenade? Manufacturers specify in manuals and often on the meter the required amerage, interrupt and voltage ratings for replacement fuses. If you select a fuse without these ratings, or even worse, place a wire around the fuse connections, believe it or not, you have just created a thermal hand grenade. You just need the right conditions to set it off. You probably won't get an explosion while working on a printer, computer, copier or equipment that has its own power supply (CAT I). You might even get away with working on branch circuits (CAT II) without setting it off. These two environments are fairly low energy and often have built-in fuse protection, circuit breakers and over-current protection circuits. However, its not a good idea nor a safe way to work. When you move to an electrical distribution cabinet (CAT III) or primary feed-lines (CAT IV), the protection circuits change significantly. 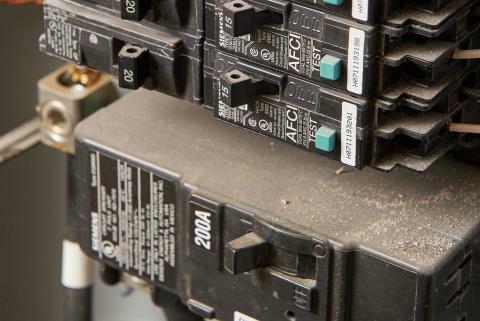 In the distribution panel you have breakers between you and the power company rated at hundreds of amps instead of the 15, 20 or 30 amp breaker on a branch circuit. 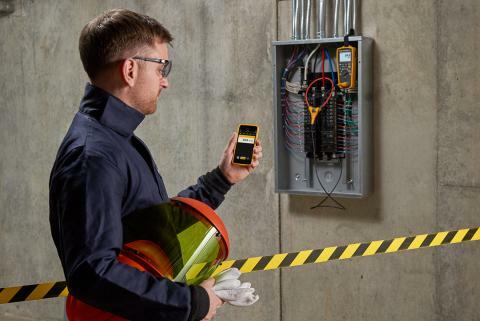 When measuring voltage on the input side of a breaker panel at a residence, the protection is now back at the utility pole or the substation. These breakers can carry thousands of amps before opening and take considerable more time to open than a branch circuit breaker. So when you accidentally leave the leads in the amps jacks and place the meter leads across one of these voltage sources without an appropriately-fused tester, you have put your life in grave danger. In this situation, the short represented by the wrong fuse (or the wire wrapped around the fuse connections) and the test leads are fed by an almost unlimited amount of energy. The metal element in the fuse (or wire) heats up very quickly and begins to vaporize creating a little explosion. In the case of the wrong fuse, the fuse enclosure may burst open from the force of the explosion to find an unlimited amount of oxygen to fuel a plasma fireball. The test leads may also start to melt, and very quickly fire and hot metal gets on your hands, arms, face and clothing. How long the energy remains applied to the tester, the oxygen available and the presence of safety equipment like face shields and heavy gloves will determine how serious your injuries will be. This all takes place in milliseconds and leaves very little time to react to the mistake. If you're lucky, you may be thrown clear of the leads or tester and thus break the circuit. But luck is not much to count on, especially when you could avoid the problem altogether by using the proper fuse. Specially designed "high-energy" fuses are designed to keep the energy generated by such an electrical short within the fuse enclosure, thus protecting the user from electric shock and burns. These high-energy fuses are designed to limit the length of time the energy is applied and the amount of oxygen available for combustion. Fuses can not only be designed to open at a specified constant current, but at an instantaneous high current as well. This high current is specified as "minimum interrupt current." 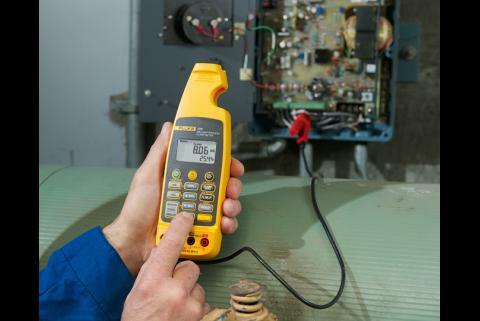 Fluke uses fuses with a minimum interrupt rating of 10,000 and 17,000 amps in their testers. 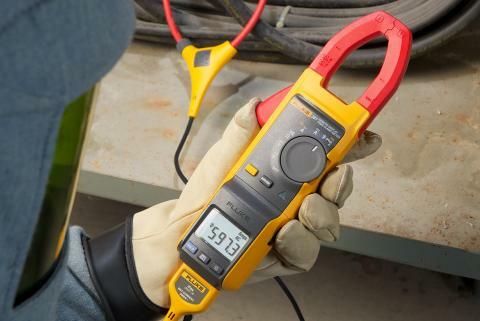 If you take a CAT III 1000 V meter with the test leads in the amps jacks, you will have a series resistance of approximately 0.1 ohms (0.01 for the shunt, 0.04 for the test leads and 0.05 for the fuse and circuit board conductors) between the leads. Now when you accidentally place the leads across a 1,000 volt source, by Ohms Law you will generate a current of 10,000 amps (E/R=I, 1,000/0.1 = 10,000). You want a fuse that will break that current and do it quickly. In addition to the specially designed fuse element, the highenergy fuse is filled with sand. The sand will not only help absorb the shock energy created by the exploding element, but the high temperatures (up to 10,000 °F) generated by the energy will melt the sand and turn it to glass. The glass coats the element and smoothers the fireball by cutting off the available oxygen, keeping you and the tester safe from harm. As you can see, not all fuses of the same amperage and voltage rating are the same. For your own safety you need to be sure the fuses you use are the ones the engineer designed into the tester. Always refer to the tester's manual, or check with the tester manufacturer to ensure you have the correct fuse. You can always get replacement fuses for Fluke testers by ordering the part number listed in the tester's manual. Your safety is worth much more than the money it takes to purchase the proper fuse for which the tester was designed.